Updated Thursday April 7, 2016 by Fremont Baseball Inc.
For Spring 2016 season, the fundraising is done by raffle tickets sale. The deadline for submitting your fundraising money (if applicable) is April 30th, 2016. The league is running a fundraiser to raise funds for a portable batting cage that will benefit our baseball players in daily practice. This is a separate fundraiser from the basic requirements you paid at player registration. What: Jamba Juice Cards offering Buy One Get One Free to use up to 6 times. How: You are suggested to sell the cards for $10 each. 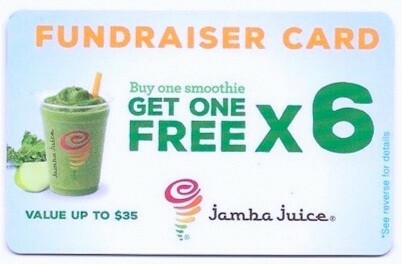 Jamba Juice will give 50% of the proceeds back to the league, which means that for each card you sell, the league earns $5 towards the batting cage fund. When: We have until April 22th to sell these cards. We would like for everyone to sell at least 2 cards, and of course you are welcome to sell more. All cards that are not sold need to be returned or you will be charged the $10 fee they are worth. We are required to return all cards that are not sold to Jamba Juice.